Have questions about an application? Not a citizen but interested in becoming one? Something else? Call, email, or stop by during our Monday evening drop-in hours and we'll help answer your question. This is a great opportunity to meet our staff and find out what relief option is right for you. Pick a Monday that works for you. DOJ Accreditation is a process by which you are able to become someone who can assist non-citizens in immigration proceedings before the Department of Homeland Security (DHS), or the Executive Office for Immigration Review’s (EOIR) immigration courts and the Board of Immigration Appeals (BIA), or both. All accredited representatives must be affiliated with an organization that is recognized (such as TRII). Our training program is about 4 months long and involves 30 hours of classroom work, 15 hours of independent work, at least 10 hours of mentorship work (more if necessary), and 1.5 hours of additional training independent of TRII's program. The program covers naturalization, asylum, relief, family based immigration, and more. At this time, TRII's DOJ Accreditation Program is only available to undergraduate students at Brandeis University. What form of immigration relief is right for you? Can you apply for citizenship? What about asylum? A different question entirely? Not sure where to start? This class is for you. Every month, we hold a 1 hour 'Immigration Overview' class where we give a broad rundown of the types of services available to people seeking immigration relief. With an ever-changing immigration landscape, it is important to stay up-to-date and understand how immigration impacts your classroom, workplace, and/or life. 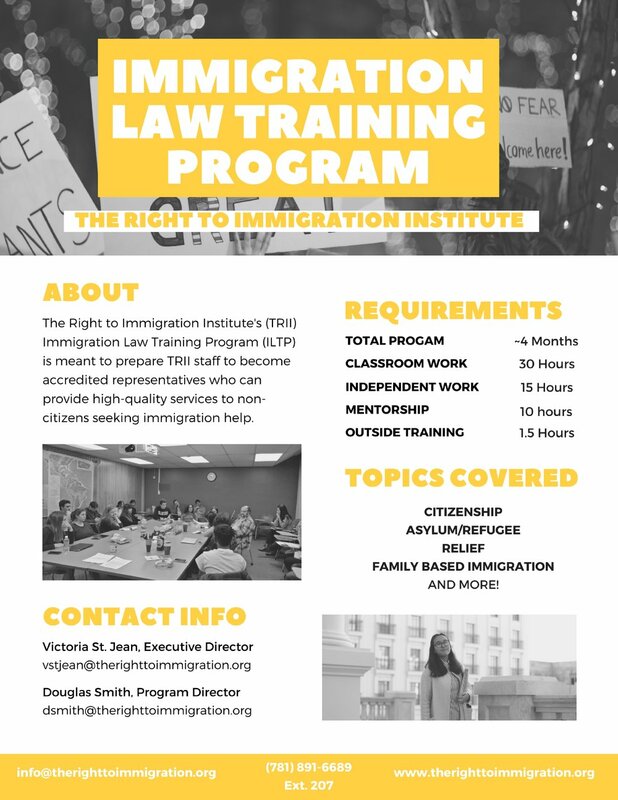 We have lead workshops about starting a non-profit, "Know Your Rights," and knowing how to lead a classroom with sutdents who are undocumented or who ahve undocumented parents. Interested in requesting a workshop? Let us know what you're looking for.